Ocean Rescuer Bob Miller has spent a life on water; teaching, lifeguarding, coaching…and surfing. 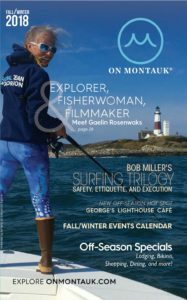 With decades of experience under his belt, he imparts some critical water safety advice in this spring 2018 issue of On Montauk. More advice from Bob follows in our summer and fall/winter editions. Stay tuned. 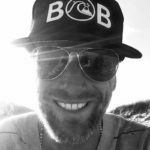 After over a decade of teaching surfing, two decades of coaching swimming, and nearly three decades of lifeguarding, there is something I’d like to share, which boils down to this; we all want to have fun, right? That’s it, story’s over? Yeah…nah, we have only just begun. But the bottom line… is about having fun. Remember the old saying that it’s all fun and games until &#*! Well, this is a story trying to prevent the &#*!, and the way to do that is to put safety first. By this I’ll suggest that you do something that you are hopefully doing anyway: be aware of your surroundings. First thing in any first aid response is to survey the scene, look for potential dangers, assess risks…then respond. When we all walk down to the beach, we take a look at the crowd and decide where to place our things. Perhaps we can also ask ourselves a few things? Is it possible the crowd is in a particular place for a reason, would you think? Possibly everyone is swimming in a particular place for a reason, perhaps…? An awareness and understanding of your environment is what we are asking for here. 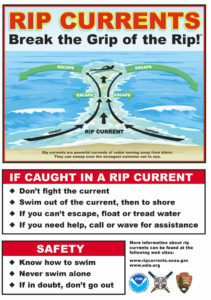 What are things like surf conditions, rip currents, rocks, and jetties? These may seem like easy questions in isolation, but they are often ignored when fun is in the air. It’s unfortunate that when we let our guard down, the &#*! happens. This is where your own personal risk assessment should be working for you. For example, people with children should swim near a life guarded swimming area while surfers should not surf in this zone. Common sense, right? Perhaps if we were all simply made more aware of dangers that we may, or may not, have realized were there all along, we’d be better able to prevent trouble. For example, we are all pretty aware that a surfboard is something that would probably hurt if it hit our, or anyone else’s, head… yes? Okay, so… what should we do if at some point we lose our boards? … cover our heads! As clever as children can be, they have taught me to call this a hand helmet… as in cover your head with your hands… kids really are amazingly brilliant! Anyway, back to that board, which is a danger to those around you if you don’t hold onto it, so… please keep a grip. Yes, hold onto it. Get flipped upside-down with it, but don’t let go. It’s a free ride back to the surface, which is where we can all do something we enjoy…breathe. Without your board you’re still doing back flips underwater, board dragging you by the leg and perhaps endangering someone else. So please… HOLD ONTO YOUR BOARD. If you can’t, put on your HAND HELMET. Okay… that said, so what if the &#*! does happen on the water? First, don’t panic, this is just a story. Second, don’t panic at the time of an incident. Panic is not good. I’m sharing these thoughts so you can think ahead about having a plan and not succumb to panic. So thank you, again, for not panicking, but instead keeping a level heard and knowing how to ask for help. Don’t panic, know this sign. Would I be aware if someone needed help? How would I contact help? The answers should be known by every parent and, really, any beachgoer. Indeed, the town has a dedicated 911 response system for ocean emergencies for which I and about seventy other men and women carry pagers for rapid reaction. Behind this system is East Hampton Volunteer Ocean Rescue (EHVOR), which was created to respond quickly to emergencies with lifeguards and equipment to make ocean rescues. 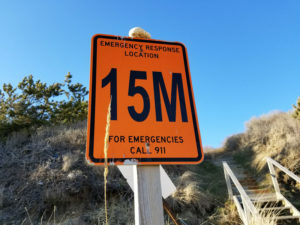 If you do need to call 911, here is a big tip that many overlook: note the letter and number of the big ORANGE sign staked at every public beach entrance. The 911 operator will ask you for it, making our response time faster. Simple awareness of our surroundings… the surf, rips, rocks, lifeguards, and of course that big ORANGE sign… can make our summer fun safer. So please remember that old saying about how it’s all fun and games until &#*! Let’s work together to keep it safe. Hold onto those boards as best you can out there, and when you can’t, remember to cover your head, especially on the way back up to the surface. Please be aware or your environment…just in case.